Time: 4:00-6:00 pm – change due to awards night at Reading High for daughter, Martha, who is graduating from high school this weekend. Troy Hendricks sent these items about their family and their ministry in Spain. The Hendricks are endorsed missionaries with SEND International. Julie Hendricks broke a bone in her knee last December and underwent surgery. New x-rays show that the fracture is fully healed. However, the pins have moved significantly and need to come out. Discomfort from the pins is increasing, and limits Julie’s walking. Surgery has been scheduled for Monday, June 7. An evangelistic campaign is planned for July 19 – August 1 in a public park. Initially, they were granted a permit to use the park only 2 out of the requested 14 days. However, the official in charge changed his mind and re-wrote the permit for the full two weeks. Pray that this campaign is very successful and reaches a lot of people. Troy’s English classes, which have met since October, are winding down for the summer. Owen Gordon (right), president of Jamaica Bible College, as well as pastor of a United Brethren church, sent this note regarding the recent unrest in Jamaica. Since Sunday the government has declared a state of emergency in Kingston and St Andrew. This has been brought on by the stand-off between specific communities in West Kingston and the police force. Subsequent governments have endeared themselves to “so-called community Dons.” Many have warned our leaders of this danger, but because of the blindness of our leaders and their desire to remain in power, there has developed a dangerous reciprocal relationship with these dubious persons, which has led to this present state. I am making this special appeal to all of God’s people to join us in special prayer for the law enforcement officers, who at the risk of their own lives are attempting to prevent Jamaica from being taken over by lawless persons. At present, the situation is mainly confined to Kingston and some parts of Spanish Town. In our area and most of the rest of Jamaica, things are pretty calm, with people going about their normal business. Many are seeing this as a unique opportunity for truth and justice to prevail and for our leadership to turn to God and turn this country around. I ask you to bear us up in your prayers! Let us stand in the gap! God is Able! The forces of darkness will not prevail! We are believing God that before this week is over, things will return to peace and calmness across our land! He had served the Munson church since 2000, and Alvordton since 2005. Paul leaves behind his wife, Rita, and four children. Funeral arrangements will be posted here when available, probably later today. This pastor’s family has considerable financial needs at this time. Bishop Phil Whipple invites you to send contributions, which will be passed along to the Webster family. Indicate that the funds are for the Paul Webster family. Karyn Marie Mohr, 59, passed away Sunday morning, May 23, in Sault St. Marie, Mich. She was the wife of Rev. Lionel “Lon” Mohr, an ordained United Brethren minister. The Mohrs had been married since 1969, and have two children: Michael (currently stationed in the Persian Gulf), and Heath. There are five grandchildren. Visitation and the funeral service will be held at the C. S. Mulder Funeral Home in Sault St. Marie. You can also look up Karyn’s obituary on the funeral home site. Visitation: 6-9 pm Thursday, May 27. Funeral: 11 am Friday, May 28. I am happy to greet you and share regarding our continued visits to churches in both the cities and villages. We thank God and are excited about our Church Planting Project. Our people are answering the call and are participating in the training. Recently we were in El Salvador to visit and gain a clearer understanding of how the work is progressing. 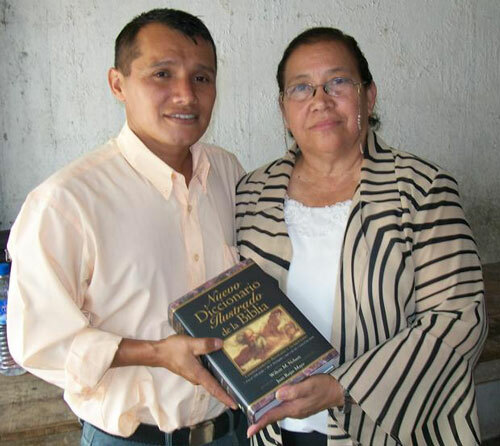 Here is a photo of Pastor Isaias of the Caluco UB Church receiving a copy of an Illustrated Bible Dictionary provided by Global Ministries for all pastors in Honduras and El Salvador through the Arnold Bible Fund. I am very grateful, as are the other pastors who have already received their copy. Students in the Huntington University Youth Ministry Leadership program meet at the Brick House Grill in Huntington. On May 15, Huntington University graduated its first students in the Master of Arts in Youth Ministry Leadership program. Four students received masters degrees. Each class consists of 90 days of online learning in addition to three days of intense, face-to-face class days in one of four locations across the U.S. This structure enables adults currently involved in ministry or other employment to conveniently pursue their advanced degree. The age range is 22-48. They come from across the US, with only 12% from Indiana. Dr. Dave Rahn (right) directs the YML program, and also serves as Vice President of Youth for Christ. He says the program’s diversity helps bring the discussion of youth ministry topics to life. Senior Pastor Steve Fish takes a video tour of the new facility. On Sunday, May 16, Shoreline Church (Oak Harbor, Ohio) celebrated the completion of Phase 1 of their building addition. The project lasted 18 months and included both new construction and renovations. They constructed a 10-foot-wide hallway that wraps around their geodesic dome, and ends with a 22-by-24-foot classroom. The hallway’s interior wall was formerly the building’s exterior wall. A kitchenette was part of renovating the original structure. They opened up what used to be a bottle-necked foyer space to include the kitchenette. They re-worked the children’s area with a new wall (backside of kitchenette), new cabinets, and new paint. They re-carpeted all the hallway spaces in the building and added a few closets. They erected a very impressive new sign. Shoreline was previously called Oak Harbor UB church, thus the need for a new sign. All of these changes have taken place since September 2008. The total cost was just under $72,000. “We scooped the first backhoe of dirt the day the stock market took its initial 500-point slide,” says Pastor Fish. “Despite this economic recession, we are so thankful to report that all of our facility improvements are fully paid for through the generosity and hard work of this people of God in Ottawa County (our own county with Ohio’s highest unemployment rate at over 18%). God has blessed us despite all of these hardships, and we celebrate the growth and his goodness to us. The group going to Germany at the end of July (click to enlarge). The first UB mission trip to Germany will occur July 31–August 14. They will work with Global Ministries staff Galen and Maritta Fiedler in conducting two five-day English camps for German students (about 30 students in each). Jim and Rhea Ferrier, from Nashville, Mich. They are former United Brethren who have known Galen Fiedler for many years. Cheryl Lamport (Rockford, Mich.). She’s an ordained minister in the UB church who, as a Huntington University student in 1975, went on a mission trip to Brazil with team co-leader Cathy Reich. Elise Nye, a high school student from Monticello UB near Spencerville, Ohio. She is the daughter of senior pastor Andrew and Jennifer Atkins. Rachel Harper, a high school sophomore from Eden UB in Mason, Mich.
Nichole Reaver, a high school senior from Monticello UB near Spencerville, Ohio. Amber Cotherman, a Huntington University TESOL (Teachers of English Speaking Other Languages) student. She is a youth worker at Bethel Assembly of God in Huntington, Ind. Hannah Harper, a high school senior from Eden UB in Mason, Mich.
Cathy and JR Reich, team leaders. They are from The Well (and formerly from Good Shepherd), a UB church in Huntington, Ind. Inset photo: Laura Branham, from Nashville, Mich.